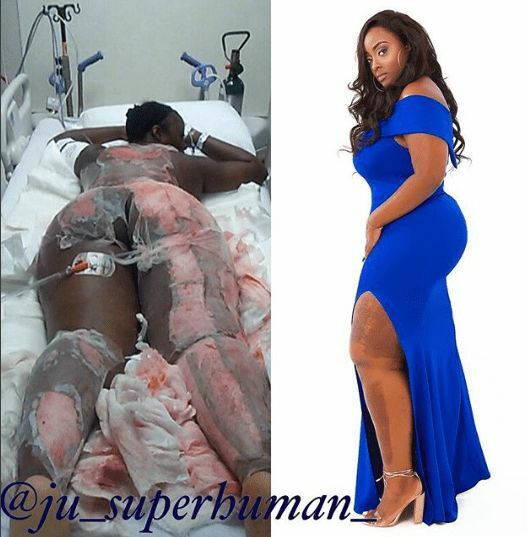 24-year old burn survivor, Julie took to Instagram to recount the heartbreaking experience of how she suffered a terrible accident in 2016 that left parts of her skin cooked. “My Story: July 21st 2016 I was a server at a (hole-in-the-wall) nightclub. The food was served and prepared under a tent adjacent to the kitchen door of the club. On that particular night there was a crowd of customers around the tent. Two of the customers got into a dispute and one pulled out a firearm and began shooting. Everyone turned to run and a propane fueled fryer was tripped over and the oil flew everywhere. It clung to the back of my clothes and began to cook my skin. At this point I was now inside the nightclub waiting for the shooting to cease. When I arrived at the hospital thirty minutes later they removed the clothes and said they would not be able to treat me there. I was given several bags of morphine and transferred to a Burn Center. I had suffered 3rd degree burns. I spent 4 weeks in the hospital and undergone 4 surgical procedures. When I was released I had three months of physical therapy to regain full range of motion. In that time I dealt with depression and insecurities. Getting over the idea that this was my new skin and my new battle was not the easiest pill to swallow. I was 22 conceited and shallow so not having perfect skin seemed like I was paying for my sins. Took a lot of seclusion meditation prayer and self love to get to the woman I am today. Now that chapter 24 is here I’m ready for the world! Never in a million years did I think this would be my truth and my purpose in life but I’m more than honored to be here inspiring people of all ages and all issues to love themselves and fight to live another day.